Feeling adventurous this Valentine’s Day? 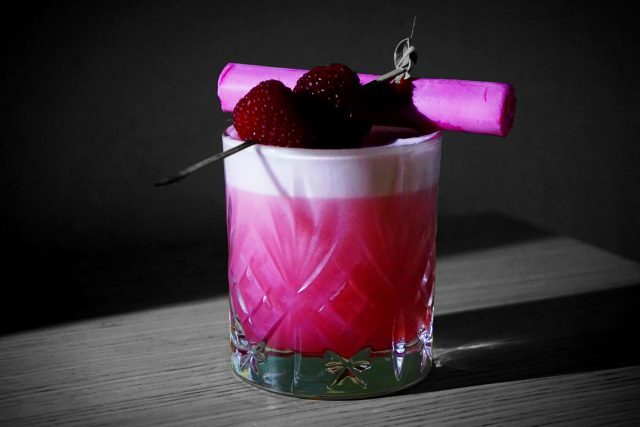 Why not try mixing up this stunning Scottish Gin cocktail from Jack at Scottish Mixology. *place a stick of pink Edinburgh rock in a pot with 1 tsp cherry jam, break it up slightly and add a splash of hot water. Muddle and stir until dissolved. 1) shake the aquafaba on its own for 20-30 seconds until thoroughly emulsified. This step is optional if you’re not fussed about the foam. 2) add the rest of the ingredients to the shaker. Add 3-4 ice cubes and shake again for 20-30 seconds. 3) fill your glass or teacup of choice with an ice cube or two and strain into it. Garnish with another stick of rock, some raspberries and a flower of your choice if you so desire. Scottish Gin fans, meet Jack Jamieson. He’s a self-taught hobbyist mixologist. This hobby started after he was taken to a Bacardi party in Glasgow and developed as he made drinks for his partner and her parents at their house most weekends. At the moment, his favourite Scottish gin is the Illicit Spirits ‘New Tom’ Gin but he’s also a big fan of Biggar Gin and the slightly different Highland Boundary botanical spirit (although it’s not a gin). Jack is usually drawn to the more unusual spirits and wines available but still tries to maintain a Scottish element to his varied creations. Check out his awesome Instagram feed here.